The Daily Dimwit: Here we go with Pack #2! Here we go with Pack #2! And we have two firsts... my first hit of the box and my first duplicate (Trout)! I guess the Susac auto is ok, I haven't heard of him but maybe one of you have and you really really really want it. Hehe... All the base cards are non-parallel despite how they scanned! I have scanned all the packs and sorted all the cards, so I do have a want list of 16 base cards if anyone is interested in making a deal: 1, 19, 20, 21, 24, 25, 30, 31, 33, 39, 43, 54. Send me a trade request and your want list if you want to swap some base! I have a total of 37 duplicates ready for trade! Man you have a lucky hand. Two packs two Red Sox. If I could pull at that percentage I would buy allot more cards. @Adam, you and me both my friend! 25 is coming your way with the ginters. on their way. 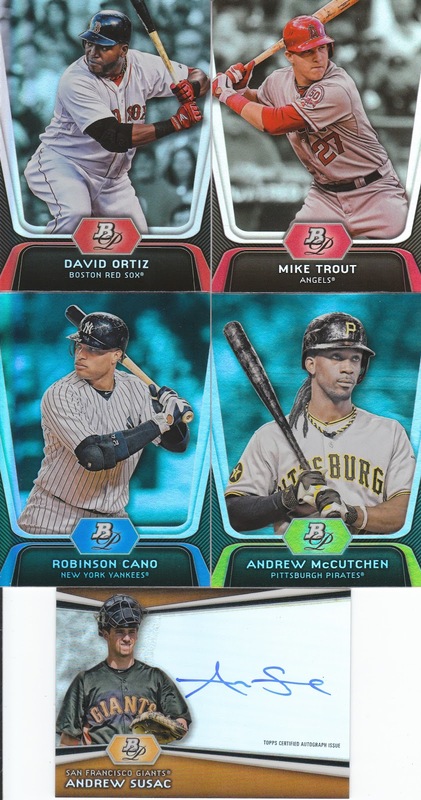 I'd love to get my hands on that Trout duplicate. I've been opening packs of Platinum but will have to get back to you on what I have available as I'm heading out of town. Lemme know about the Trout though! Selling on eBay - Need Bidders! Trades, purchases, breaks and just because! Pack 19! We're almost done! Pack 18... couldn't be more "meh"
August Group Break Sign-Ups Are CLOSED!!! Give me a high 5... a Pack #5 kind of high 5!!!! Pack #4 of the box-a-thon! Pack 3 for your viewing pleasure! Happy Birthday To Me! August Rocks! Pack 1!